I’m sure I have seen this one before. 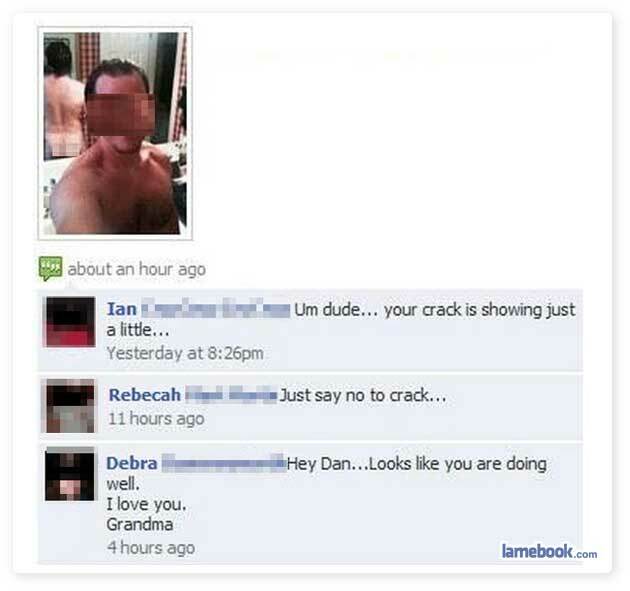 Grandma likes what she sees. This semi-naked bathroom photo looks like the appropriate photo to judge how succesful you are…..hrmmm yes, you seem to be doing quite well dan. I am confused with the time stamps. What is the “an hour ago” part referring to? The “about an hour ago” is the last time someone commented, not when the picture was added. There are probably more comments under the Debra’s (grandma’s), but they are cut out of the post. It’s pretty cool how that dude’s just mooned all his facebook friends and pretended it was an accident. Good work dude. #4 I am confused to, not so much about the timestamps but more in general.